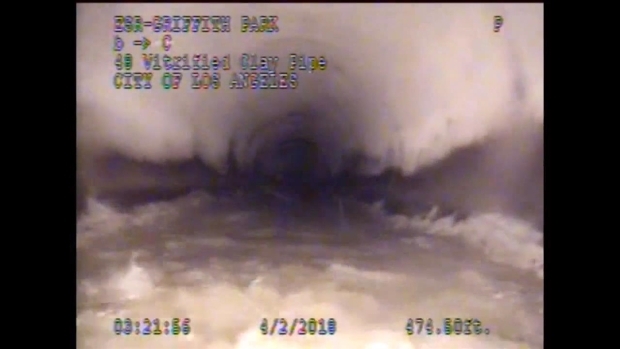 About 13 hours after he was reported missing, sanitation workers lowered a camera into a section of the expansive pipe system and saw Jesse Hernandez "alive and talking"
A 13-year-old boy who fell into a sewer pipe during a family Easter celebration at Los Angeles' Griffith Park has been found alive after a methodical 12-hour search of the drainage system. Jesse Hernandez was located in a pipe about a mile east of where he fell Sunday at the sprawling urban park between the San Fernando Valley and Hollywood. Searchers using closed-circuit cameras that were lowered into the pipes noticed what appeared to be hand marks on one of the pipe walls, leading rescuers to a section of pipe near where the 134 Freeway passes underneath the 5 Freeway. Sanitation workers opened a maintance hatch and found Jesse inside. "It does feel like a miracle," LAFD Fire Capt. Erik Scott said. "Mouths dropped when that hatch was opened and we got reports back that Jesse was alive." 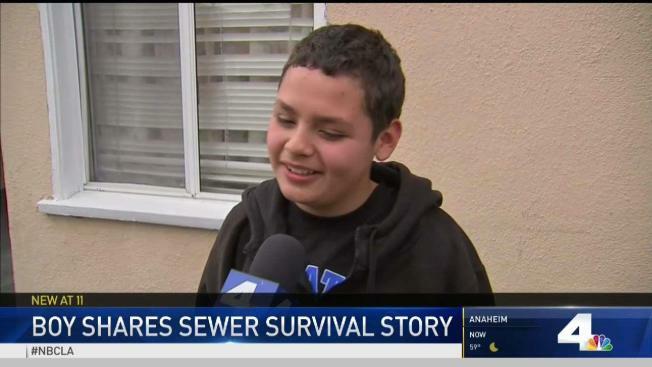 A 13-year-old boy named Jesse Hernandez who was miraculously rescued describes the nearly 12 hours he spent in the city's underground sewer system. Kim Baldonado reports for the NBC4 News at 6 on Monday, April 2, 2018. Scott said the sanitation crews played a major role in finding Jesse. They identifed the most likely areas where Jesse would be found -- an area that included about 6,400 feet of sewer line, 2,400 feet of which were searched when he was discovered. They further narrowed the search area after noticing the hand markings on the closed-circuit camera feed from inside a pipe. There were two cameras floating from each side of the 6,400-foot search area identified by the sanitation department. "It appears he was trying to get out," said LA Sanitation Department Assistant Director Adel Hagekhalil. "Right away, our team focused on that location." Sanitation workers opened the maintenance hatch and saw Jesse about 11 feet down in the pipe. The section of pipe was large enough for him to breathe and stand. "The first thing they heard is, 'Help!'" Hagekhalil said. "They were thrilled." Workers lowered a hose down to the boy and pulled him up. Fire-rescue team members provided immediate medical aid and transported the boy to a hospital in serious condition. He will be decontaminated due to possible toxic substances in the pipes, Scott said. New video has been released of the rescue of a 13-year-old who accidentally fell into a pipe, as authorities discuss how to prevent this from happening again. Angie Crouch reports for NBC4 News at 4, April 2, 2018. Jesse was given a cell phone so he could speak with his parents, who Scott described as "overwhelmed" with joy. Family members wrapped in blankets stayed at the search command post overnight. The boy was taken to a hospital for a full evaluation and to be reunited with his family. In an interview with NBC4 on Monday, Jesse said he was tired and a bit scraped up, but otherwise OK.
"I was praying to God to help me and to not die," Jesse said. 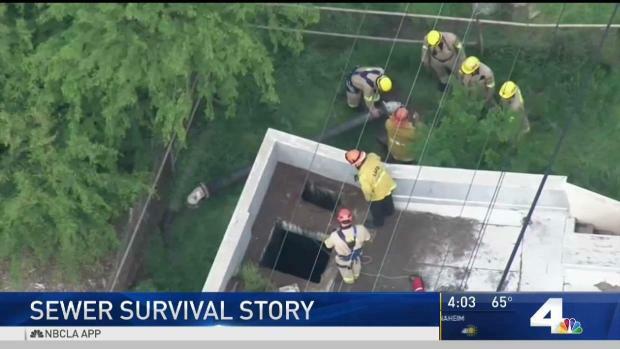 He spent nearly 12 hours trapped in the sewer system underneath Griffith Park before rescuers got to him. "It was all quiet. You could just hear the water running through and you couldn't see anything. It was dark," Jesse added. 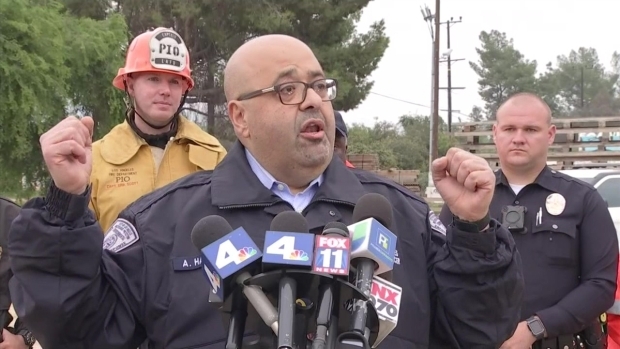 LA Sanitation Department Assistant Director Adel Hagekhalil describes the moment a 13-year-old boy who fell into the Los Angeles sewer system was found. An "extensive" multi-agency search by air and on the ground continued overnight after Jesse fell about 25 feet into a drainage system. More than 100 firefighters from the Los Angeles Fire Department were on scene at 5254 West Zoo Dr. in Hollywood around 4:30 p.m. after witnesses reported the fall. Jesse was jumping on a wooden plank atop a concrete building when the plank gave out underneath him, according to the Los Angeles Police Department. The area, a decommissioned LA city sanitation facility, was fenced off, authorities said. Jesse then fell into a drainage pipe, which was full of low-flow running water and sewage. The pipe system feeds down to the Los Angeles River and due to water and gasses in the system, the environment would be difficult for one to breathe, officials said. Devin Hernandez described his friend Jesse as "really nice" and said they had earlier been playing soccer together before parting ways so each of their families could do an Easter egg hunt. "It's sad that this happens to him because he just came to the park to have fun," he said. Aerial footage from NewsChopper4 showed search activity at the drainage system in Griffith Park, a nearby water treatment facility and the LA River. Video released by the city of LA's Department of Public Works shows footage from the camera used in the hours-long search and rescue operation of 13-year-old Jesse Hernandez. The boy was found alive on Monday, April 2, 2018, after falling down a sewer pipe in Griffith Park. The Department of Sanitation and LAFD worked closely to map out the closed system of sewage pipes "which requires a detailed search along each possible path of travel," according to the fire department. LAFD's Urban Search and Rescue Task Forces also mounted a specialized camera on a flotation device which was tethered to a rope and extended 300 feet down a pipe. Firefighters were also using gas meters during the hours-long search. Shortly after 10 p.m., LAFD announced that specialized "closed circuit" cameras were being brought in to further the search. The cameras "have more advanced capabilities including lighting and the ability to attach to a pontoon which will crawl along the pipe." The pipes are four feet in diameter with varying depths of water moving at approximately 15 mph, the department added. The fire department was assisted by the LAPD, the California Highway Patrol, Los Angeles City Recreation and Parks, Park Rangers, the Department of Water and Power and the Department of Sanitation.